Reading your spark plugs can be very beneficial to determine the health of your cars engine. The results can be a carbon fouled spark plug in one cylinder or a completely black and dry spark plug. Understanding each scenario will enable you to diagnose issues much easier. You could have invested into the best spark plugs for your car but if they are fouled up by carbon deposits, they will never be able to perform to their full ability. 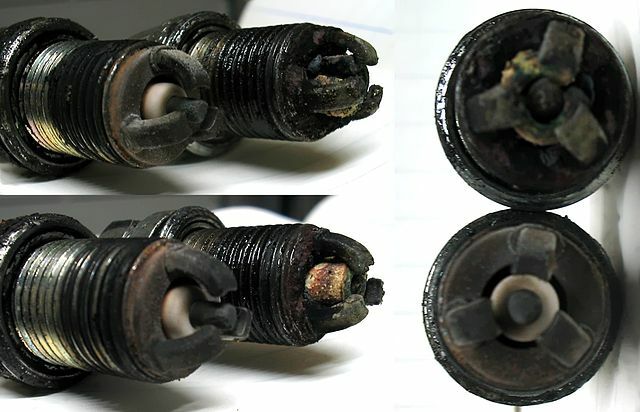 A defective spark plug such as one that is covered in black ash will effect the performance of your car. If they are fairly new spark plugs, don’t buy new plugs until you have found the root cause of why they are fouling. and many more less common problems. The appearances of the spark plug will alternate between all the engine running factors. 2 How To Read Your Spark Plugs? Clean The Work Area. The last thing you want to happen is some dirt to fall into the cylinders when you take the spark plug out. Ensure there is no dirt or dust around the work area. Remove First Plug By The Boot. The term boot is given to the connector that connects the spark plug to the engine. Older style engines will use HT leads that will need to be removed prior. Unscrew Spark Plug. Using a spark plug socket fitted to a wrench, place the socket on the plug and turn anti-clockwise without using too much force. In only three steps you can remove a spark plug, it is that easy. The most important thing is not too apply too much force with the wrench to loosen them. If you end up breaking a spark plug that falls into the cylinder, you can be in trouble. To make your life easier, invest in the best spark plug tool socket to pull the plug out. The GearWrench socket would be the “go to” socket for any job involving spark plugs for the majority of mechanics. How To Read Your Spark Plugs? The purpose of a spark plugs is to ignite compressed petrol from an electric spark generated by the plug. If the car is not running correctly, check the spark plugs as assess the state of it to diagnose the issue of the car. Using the 3 step guide to remove a spark plug safely above, you will be able to examine the plug in less than 5 minutes. The appearance of the spark plug can be very informative and below is a list of the most common states a spark plug can become. Its important that you understand the normal state of a spark plug. There will be slight carbon deposits from normal engine combustion with a brown/grey tan color that signifies a normal running engine. A soft black sooty carbon fouled spark plug is a tell tale sign of a car that is running too rich or has an incorrect air to fuel mixture. Check that the air filter is not clogged up or there is no carburetor issues. If you have been adjusting the fuel to air ratios, clean the spark plug and retest then pull the plug out after 100 miles. If you find a build up of oil on your spark plugs, this can be a worrying sign. If implies that too much oil is entering the combustion chamber caused by worn piston ring or cylinder walls. This will require an engine assessment and a fair amount of work. This is fairly rare but occurs in high mileage cars or classics. Along with a white texture on the plug, you will also notice it is dry looking from running too hot. An engine running to lean usually has too much air entering the mixture. The car will run well cold but when warmed up, there will be performance issues. Running to lean will cause more issues and damage than running too rich. Plugs that have been used for longer than they are meant to be will have a rounded electrode and small amounts of carbon deposits. You will feel the symptoms in the car performance and a significant loss in power than can be regained with new plugs. If the spark plug looks damaged from chunks missing or lots of scratches, this could mean there is a foreign object in the engine. Often the wrong plug with an incorrect reach is installed that results in the piston rings striking the plug because it is too long. The manufacturers of the best synthetic oil for your car give their take on what to look out for with your spark plugs here: https://mobiloil.com/en/article/car-maintenance/advanced-car-maintenance-tips/how-to-check-spark-plugs. Considering how easy it is to remove the plugs, you should clean them up and test before buying new ones. By using a simple wire brush to remove carbon deposits, go for a long drive, wait for the engine to cool down and remove them. This should give you a clear indication of whether or not change you have made have made the engine run normally.